LTE brought a completely new network architecture and managed to revolutionize the data capabilities ever achieved on a mobile network. LTE also brought a new type of radio network, much simpler in its organization. In a previous post we discussed about OFDM being the main reason behind LTE’s high data speed. 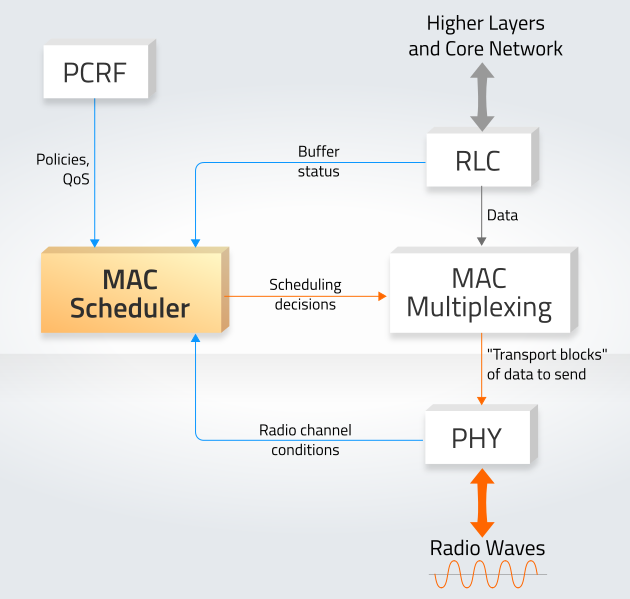 Today we look into an essential component of the LTE radio network: the MAC Scheduler. Sitting just above the Physical layer, the MAC Scheduler assigns bandwidth resources to user equipment and is responsible for deciding on how uplink and downlink channels are used by the eNodeB and the UEs of a cell. It also enforces the necessary Quality of Service for UE connections. QoS is a set of rules that come from the Policy and Charging Rules Function (PCRF) in the core network. These rules define priority, bit rate and latency requirements for different connections to the UE. They is usually based on the types of applications using the UE connection. For example, the QoS requirements for a VoLTE call are different from those for checking the e-mail. 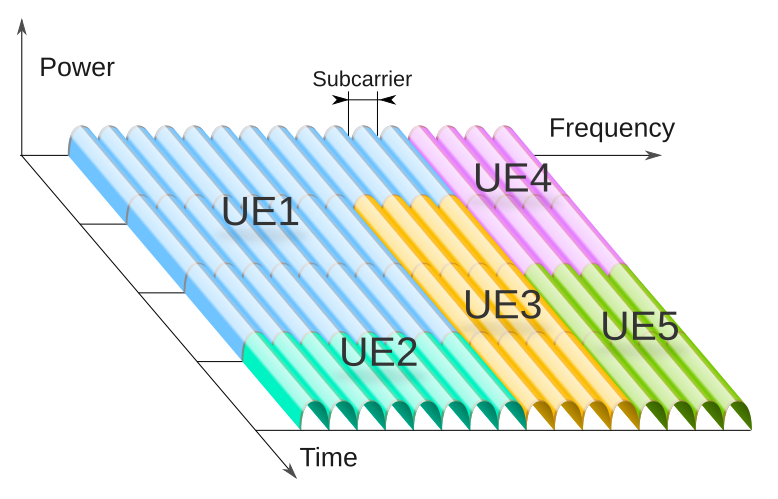 As seen in the image below, the MAC scheduler has control over the OFDM modulation in the sense that it decides, according to information received from other LTE network components, how much bandwidth each UE receives at any given moment. In this figure, the resource element (sub-carrier) is represented on the frequency axis, while the sub-frames are represented on the time axis. This figure shows downlink scheduling, but the MAC Scheduler controls uplink scheduling in a similar way. QoS data from the PCRF: minimum guaranteed bandwidth, maximum allowed bandwidth, packet loss rates, relative priority of users, etc. messages from the UEs regarding the radio channel quality, the strength or weakness of the signal, etc. measurements from the radio receiver regarding radio channel quality, noise and interference, etc. Typically, a MAC Scheduler can be programmed to support one scheduling algorithm with many parameters. One of the key features of LTE is the ability to control and prioritize bandwidth across users. It is the MAC scheduler that gives LTE this capability. this discription is from UE side or network (EnodeB) side. i want to know how MAC scheduling done by EnodeB for multiple UEs.